Put the water with the red pepper, the Greensweet sugar, the wine vinegar and the salt in a pan and bring to a boil. Cook for two minutes and turn off the heat. Allow to cool completely. Meanwhile, peel the cucumber, cut it lengthwise and remove the seeds with a spoon. Then I cut half-moons. 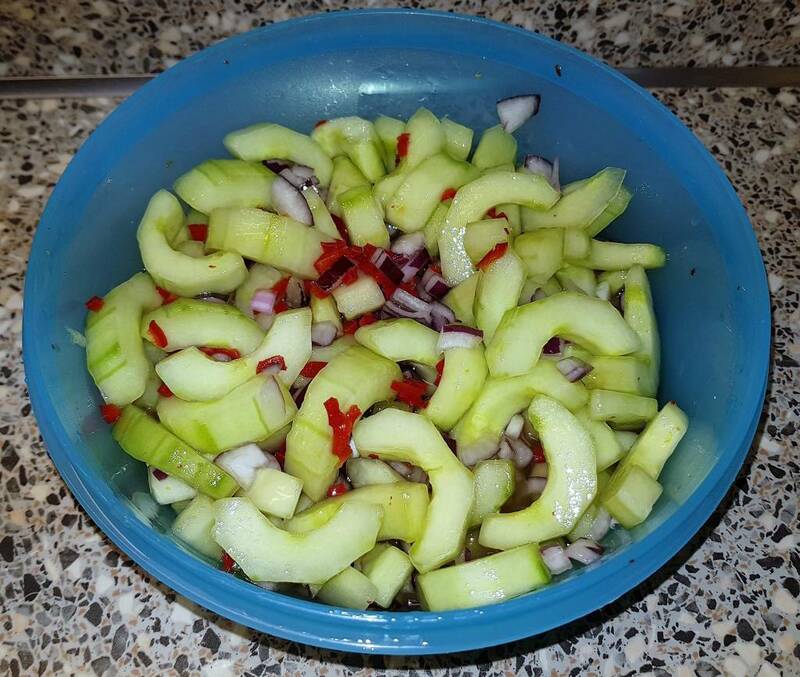 Put the cucumber, the chopped red onion in a bowl and mix. Sprinkle chilli pepper from the grinder over it (not too much) and mix. Pour the water with the pepper etc. over it and put it in the refrigerator. Delicious pickled sweet acid for spicy dishes. I eat it with my Surinamese noodles. If you eat all that together, it's 13 points!